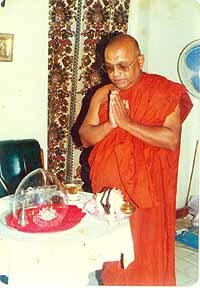 According to a sermon conducted by late Venerable Watarappala Nandarathara Thero. Venerable Watarappala Nandarathana has conducted several researches, into the above subject, and he is the person who found the youngest reincarnation, from Ceylon. His findings are published in "Twenty cases of Reincarnation," in USA. There is a big difference between "Reincarnation" & the word "Re-Birth". Buddhist philosophy speaks only about Re-Birth. Any individual dying could be reborn in any form, either as an animal, human, enlightened being, demon, or in any other living form. The word re-incarnation means superimposing the existing life form, which is an alien theory to Buddhism. Lord Buddha taught that births could occur in four ways. From eggs like chicken, from a womb like humans and horses, with interaction of only one parent like bacteria, or with out any parent. The births explained are not limited to this world but other worlds such as heaven and hell and it is explained that many beings are born without parents in these two spheres. There are several instances in which unusual births have been reported recently. A Young lady in Spain named Iris died and preparations were made for the burying but suddenly she came back to her senses. She told her surprised parents that she was not their child but a 44-year-old woman named Lucia from Portugal having 14 children. Now she could only speak Spanish. After checking the records in Portugal it was proved that a Lady name Lucia with 14 children had died recently. A similar thing happened to an Indian boy who regained conscious after being pronounced dead. He claimed that he was a 22-year-old person who died after being poisoned, on his way to collect a debt. He gave a complete description of his previous birth & they were able to trace the dead person. His claim was taken very seriously, and the debt was repaid to this re born Indian boy. These incidents prove that individuals can be born in other peoples bodies without any interaction of parents. A small baby girl aged one year & three months named Priyanthi happens to be the youngest mother recorded who had " Triplets " removed from her body & these small babies are now displayed at the Medical College at Borella. These babies had been alive for some time. If they were dead from birth Priyanthi would have developed blood poisoning in her early years. This incident shows that even a single parent can conceive children. The same situation is shown in the Bible where the Virgin Mary had Gods child given to her before she met Joseph. We have seen several instances where reincarnation can be proved. Taking examples from the western world, we could take " Edgar Casey " & " Bridey Murphy ". The theory of Reincarnation - Re birth is now well accepted by the Westerners and this could be understood by the new series of Hollywood films that are based on re birth, such as The Ghost, Sixth Sense, Matrix, Heavens Can Wait, return of the Mummy, etc. People are born strangely some times without eyes & limbs, to this world, & it stands to reason that this is the "Karma" that they have continued from their previous birth. Edgar Casey revealed from his self Hypnosis trances that one person had gone blind, as he had made "his prisoners blind" by stabbing with a iron, when he was born to an African tribe. Lesser known incidents come from Sri Lanka and involve the Re Birth of Shamen; after he and his step mother both died from a train accident. This documentary was shown on television with both parents from his two lives reporting. The youngest researched re-birth comes from Sri Lanka - from a small boy of three years, who wanted to drink Arrack at his tender age & identified "Kusuma" his 58 years old wife from the previous birth. His previous birth was as "Sammy" a sacked worker from CGR (Ceylon Government Railways) who later made his living selling Arrack. This boy was frightened when he hear the sound of any Jeep claiming it to be the Police coming to arrest him. Researches even collected the legal documents relating to his numerous arrests for selling liquor. There is a another girl born to a very rich family, who spoke of her pervious birth in "Sella Katharagama" (a very poor house) but she wants to go back to her previous mother. And there is another case of a rich planter called "Sudu Mahaththaya" now born to a very poor family. Story of Buddhist Priest - Muditha-Ghosha who copied "Thri-Pitakaya"
But the finest of all researches comes from Sri Lanka, concerning a boy who used to utter "pali" words from Buddhist teachings when he was just one year old. At the age of three he was able to recite all "suthra" for one long hour without any mistake. A taped recital shows us a new melody, on which had been recited thousands of years ago. His punctuation and beautiful elaboration on "Pali" words pronounced shows a much higher level of "Pali" education, definitely not available today. Every day even from his tender years he used to meditate from two Oclock midnight to morning and when he was meditating a light blue ray was emitted from his body which made him visible even in a dark room. Research into his previous birth led to the finding that he had lived during Lord Buddhas time and saw his last rites ("Parinirwana" ceremony) being conducted. He clearly explained the elaborate procedure followed by the procession carrying remains of Lord Buddha. His next birth has been in South India as a Buddhist Monk, (he was named "Muditha Ghosha") who came to Sri Lanka with the renowned Buddhist Monk "Buddha-Ghosha". They stayed at the "Maha-Viharaya" and on the third floor of "Lowa-Maha-Paya" in Anuradhapura. They wrote the preaching of Lord Buddha " in Ola leaves. When he was taken to Aunradha-puraya in this birth, he was even able to point out the restoration errors made when conservation work was carried out on these temples. He explained that " Ath-Thora " (leaf from a tree growing only in South India) was used as carbon papers during his time for duplication of these writings and this was proved to be true. American & German scientists carried out a lot of research about this boy but they were not able to give a suitable answer even after using modern day science. Many people whom die in accidents has claimed, that their astral body got detached from the human body & they were hovering above seeing their own body being attended by others. Young boy Shraman, (who had previously, died on a train accident), claimed that he waited in and around "Sri Maha Bodhiya" and selected his future mother & even came behind her waiting for a chance to enter her womb to start a new life. This is explained by the belief that that a fertile egg has to be in a womb for a "hovering Soul" to enter the mothers body. And if such entry does not take place, the egg will not develop any further. This could be proved from the fact that there are very many married couples married for very many years, who are medically fit but not having children. This situation is further explained & depicted in the Ruwanweli temple in Anuradhapura, showing Queen Vihara Maha Devi pleading to a dying monk to become her child (Duthu Gamunu) The monk died while the queen was travelling back to the palace & his soul entered the Queens body while she was still in a chariot. We must understand that great Sinhala Kings would not paint such pictures in detail in "Ruwan- weli-saya" unless they did understand this reality. Lord Buddha himself has given a vivid detail of his previous births showing the complexity of the human nature in "Pansiya Panas Jathkaya". Further the "Pretha Watthu & Wimana Waththu Prakaranaya" speaks about humans born in lower forms as "Pretha" or in higher forms as "Gods". There have been several incidents where, children have been troubled by "angry powerful beings" and in the case of Shereen it was her dead father. This being has given gold jewellery, and even had bank notes taken out from "Barclays Bank "in England". There was another child who was attacked by her dead grandmother and these injuries could be seen even today. The research was carried out while her hands being tied and she still developed wounds in her body in front of the research team. This document was prepared from a cassette representing research carried out by Late Venerable Watarappala Nandarathana Thero and from photos & eyewitness evidence, & some research papers are available with his students in Sumanarama Temple in Galkissa.